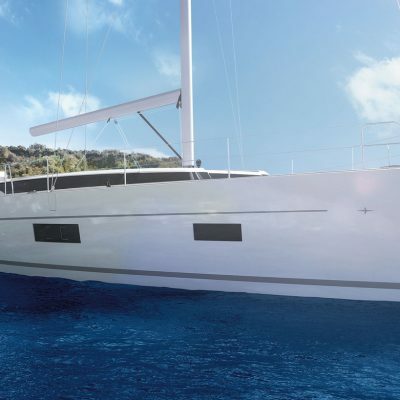 Creating a new benchmark in the 50 foot category. 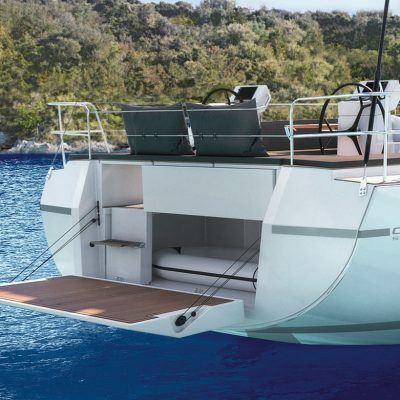 Her twin wheels, dinghy garage and performance rig takes the pleasure and ease of sailing to another level. 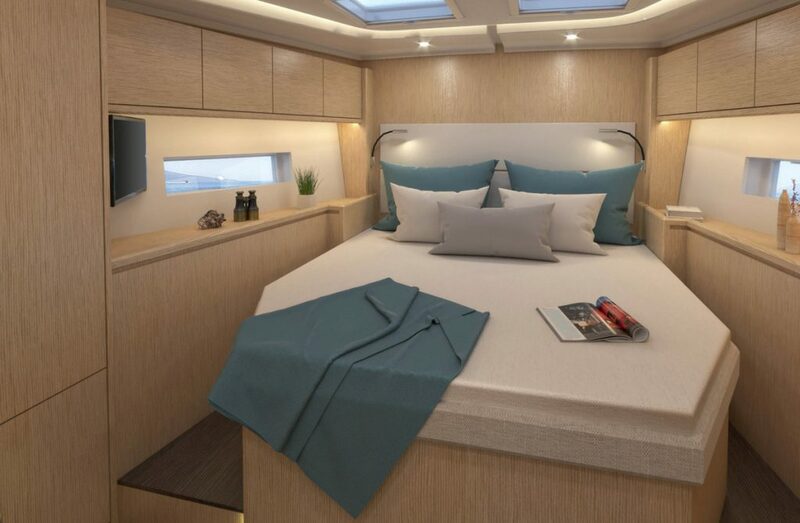 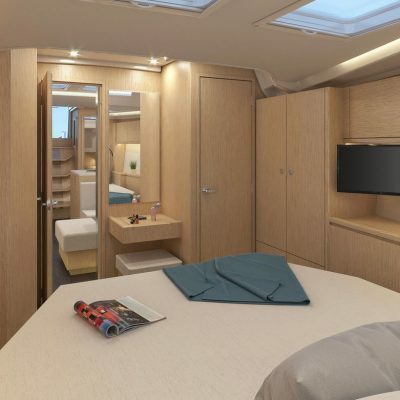 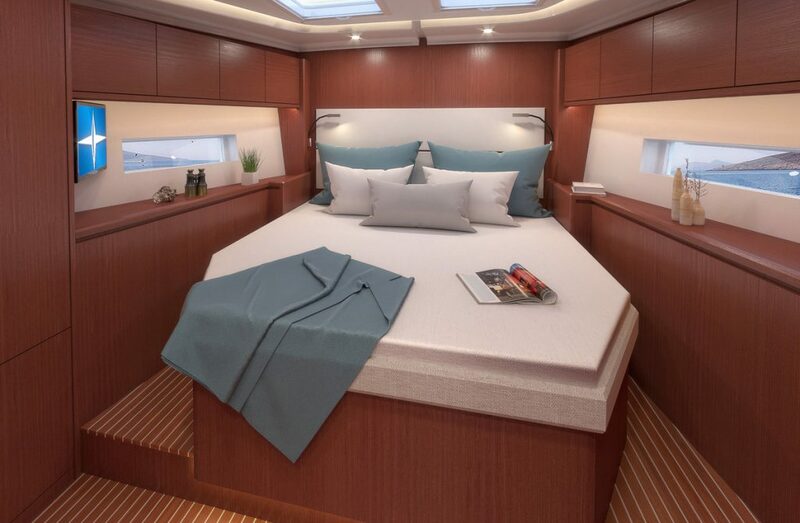 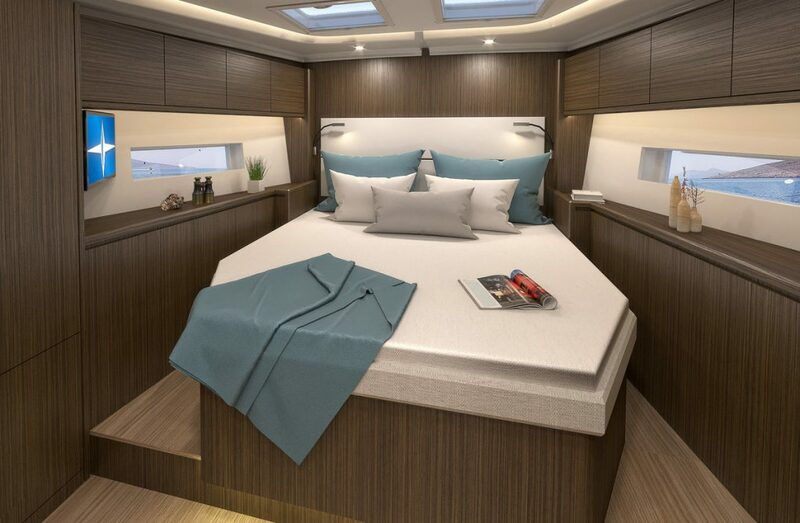 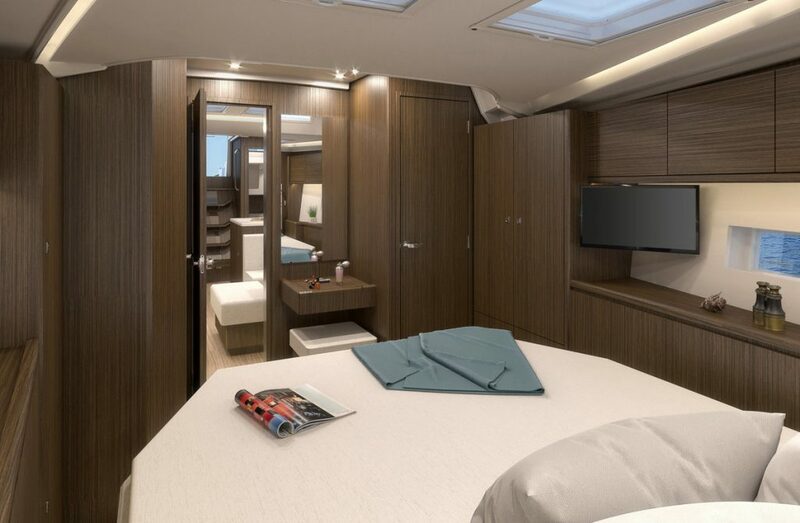 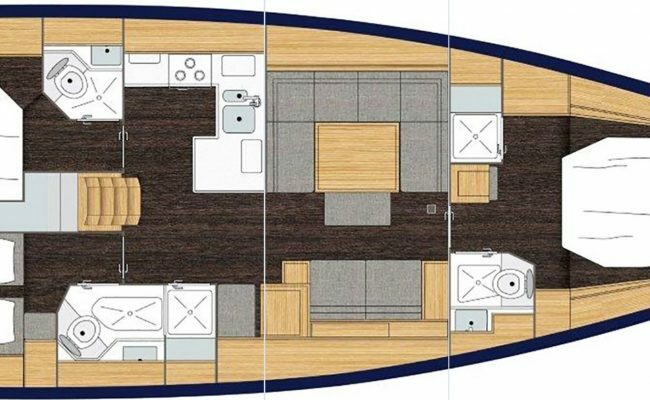 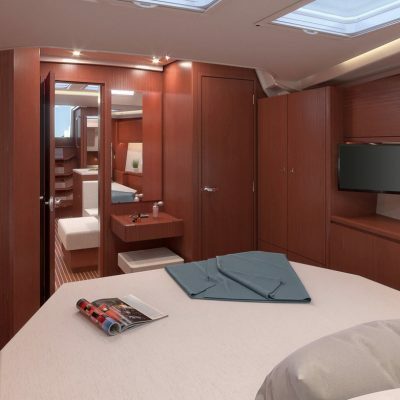 With 3, 4, 5 or even 6 cabins to choose, together with multiple upholstery and wood combinations, the level of customization is unparalleled. 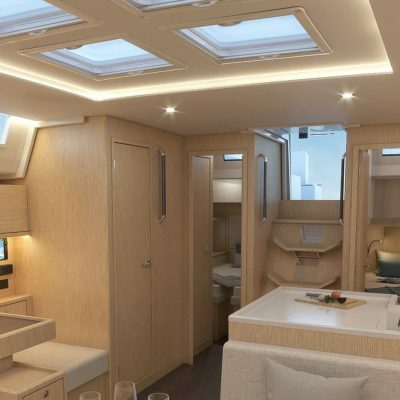 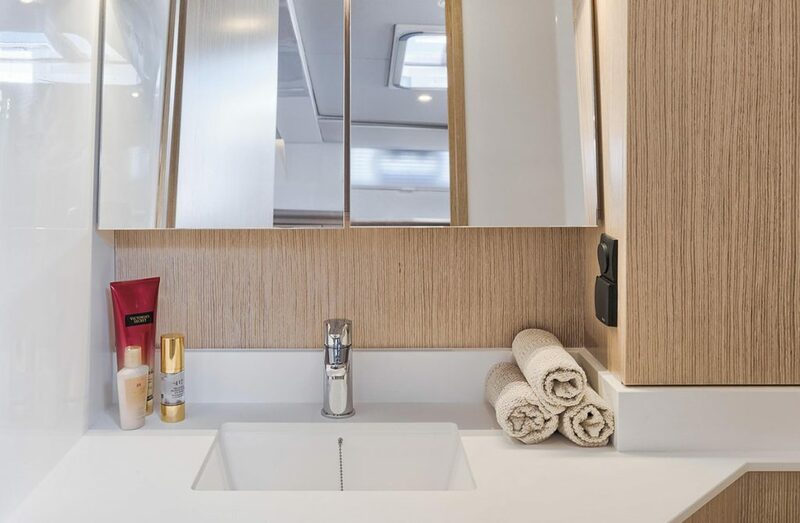 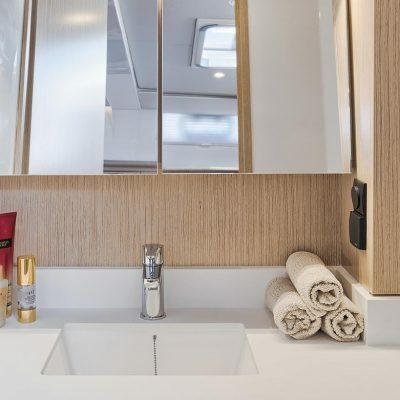 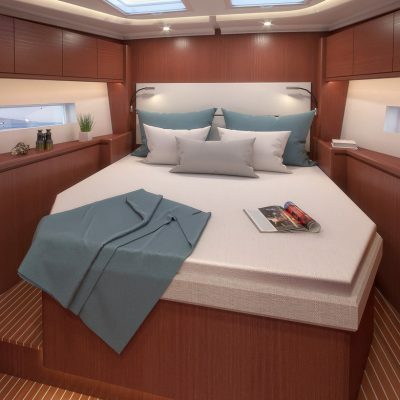 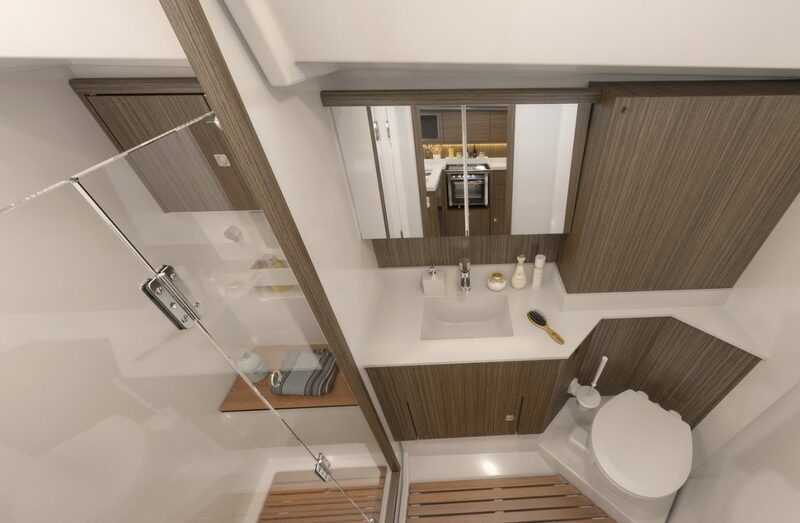 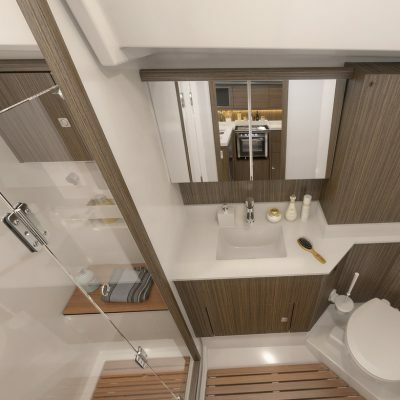 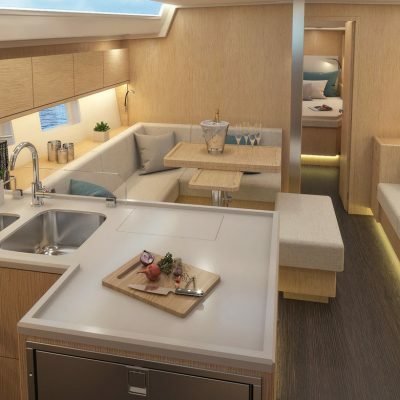 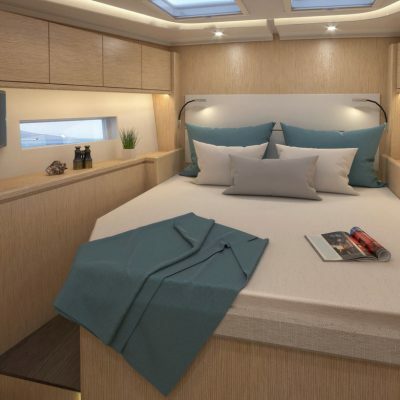 An enormous swim platform, innovative cockpit layout, self tacking jib, and sumptuous comfort above and below deck, means she is perfect for sailors and sun-worshippers alike. 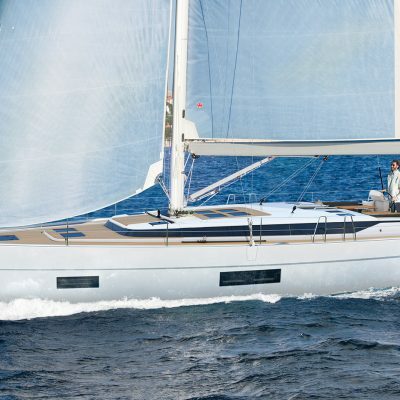 Maurizio Cossutti and his team masterminded the design of the brilliant Bavaria C50. 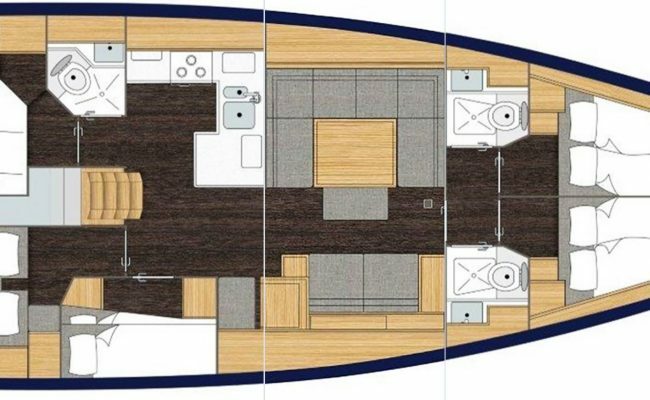 The elongated hull has three big windows, a long window strip, and a coach roof design gives a silhouette not dissimilar to that of a super-yacht. 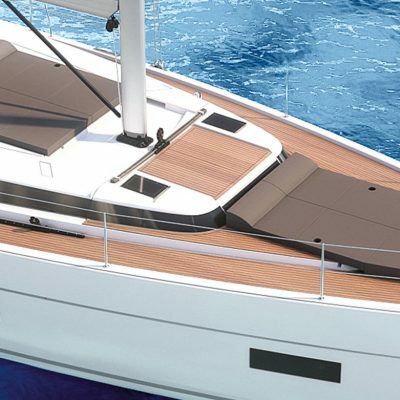 The walk on deck is clear and minimalist with all of the halyards and sheets for the sails run to the stern inside the superstructure. 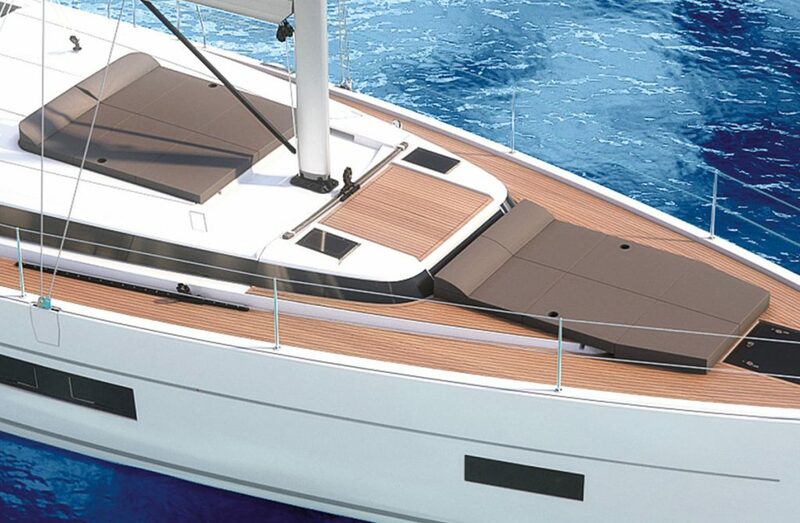 All of the hatches are recessed into the deck and provide optimal lighting and ventilation. 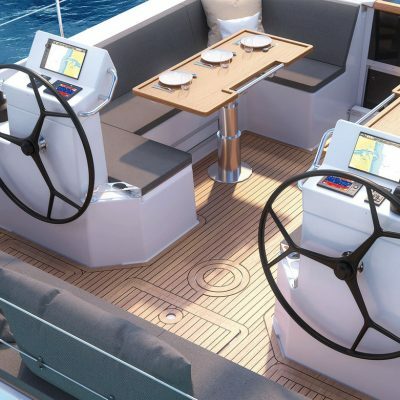 The aft cockpit is divided into a forward “relaxation” area and then a “sailing” area which means total enjoyment for everyone. 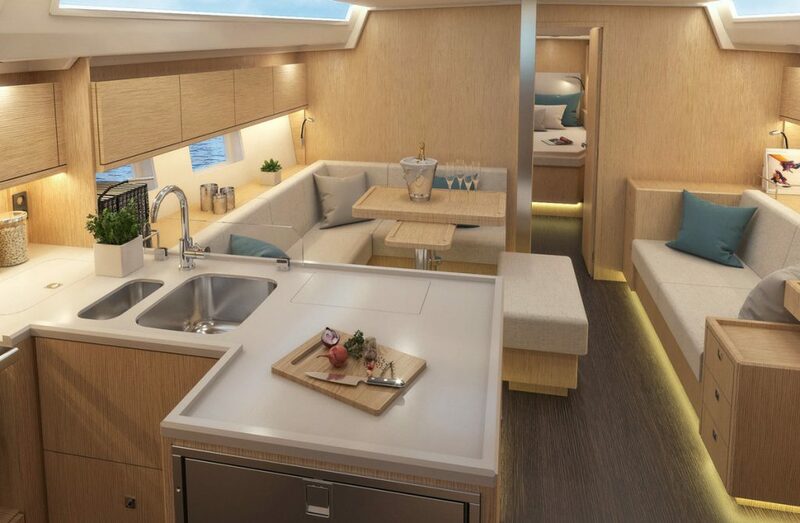 The innovative twin cockpit tables can be lowered in just a few moves to create an open lounge area. 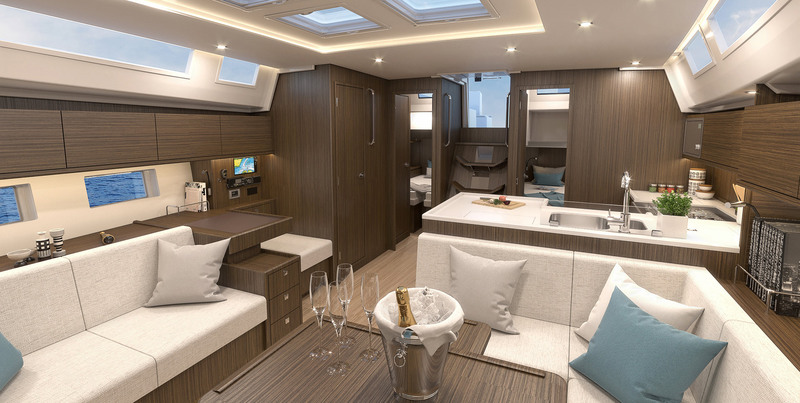 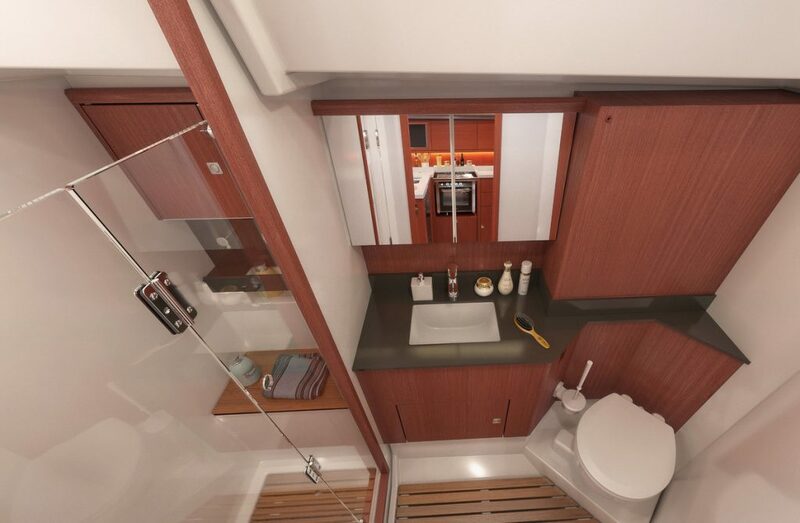 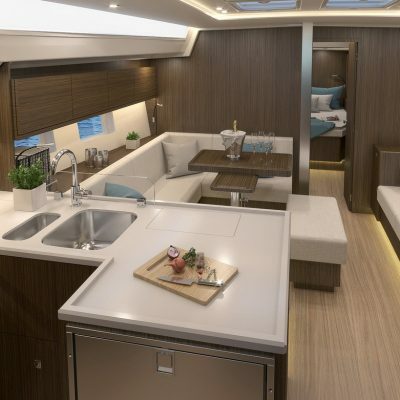 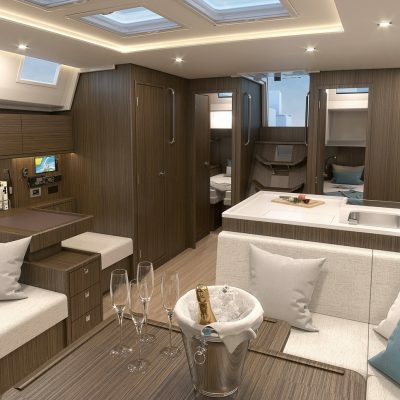 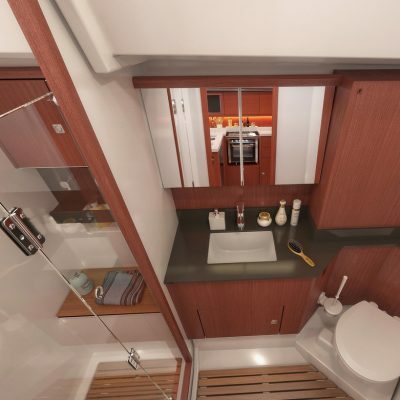 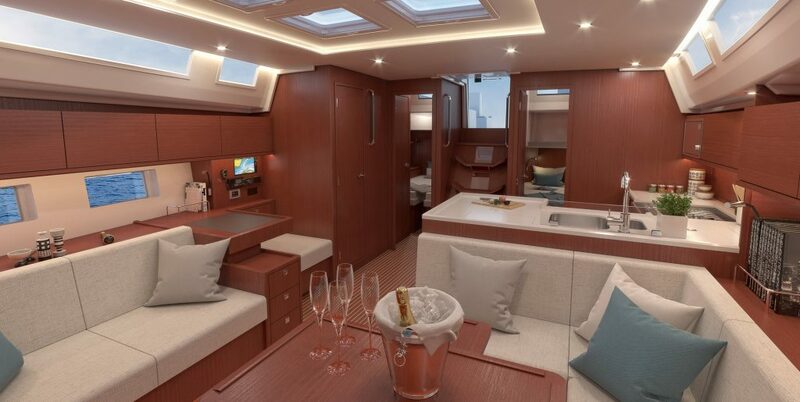 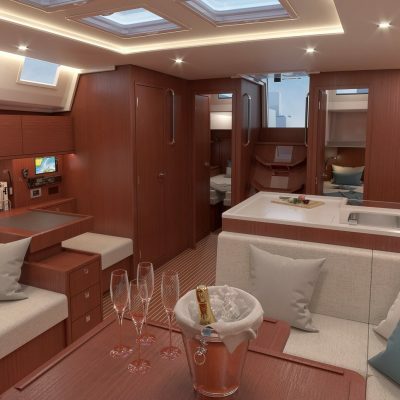 Also in the cockpit there is a sunbathing area, a fold-down BBQ and wet bar including a fridge, making it a very enjoyable living area. 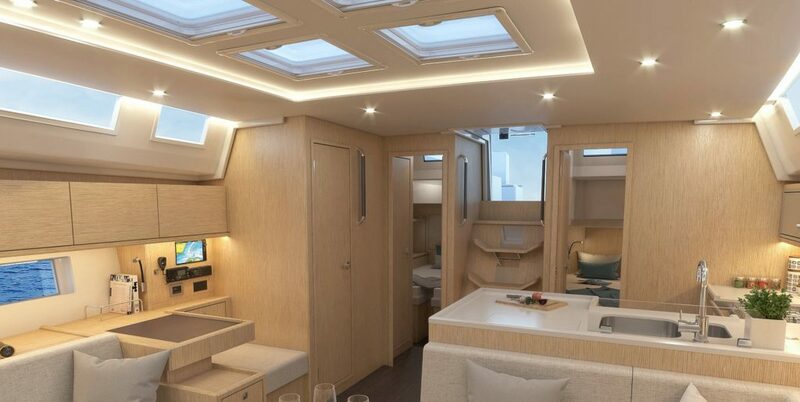 Those looking to sunbathe at anchor can do so in comfort on expansive sun-bed areas under the boom and forward of the mast; total relaxation. 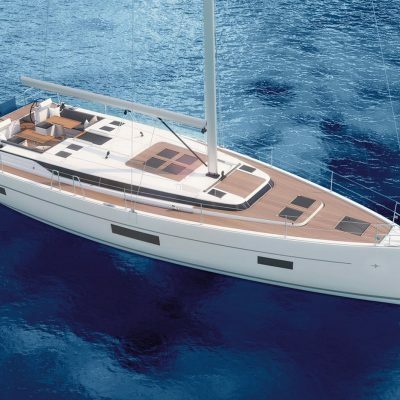 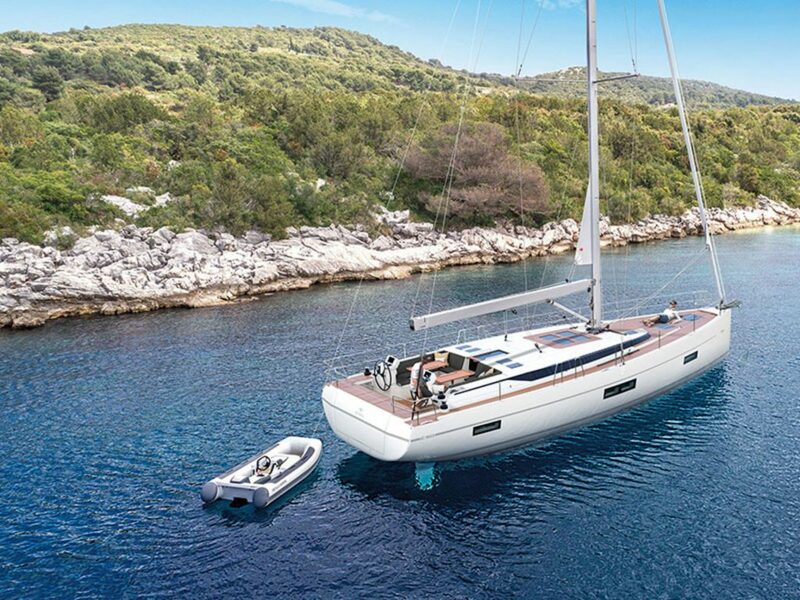 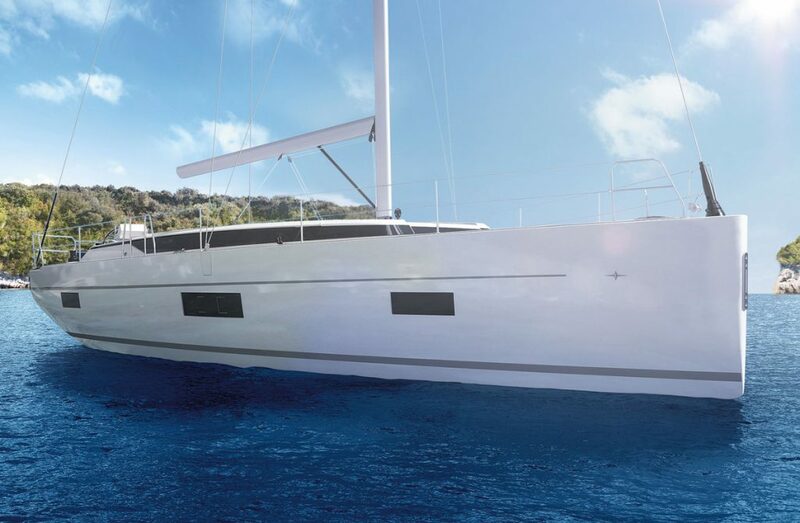 With a deep keel of 2.3m, (7’7”) perfectly balanced twin rudders and hulls made using the lighter Bavaria Vacutec infusion technology, she is designed to give a superior sailing experience. 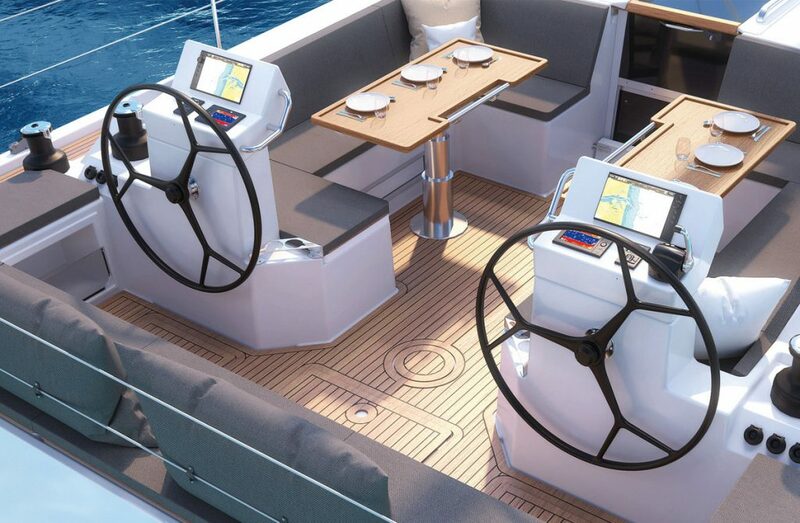 All the sail controls are led back through under-deck conduits, to be trimmed at four electric winches at the twin helm station. 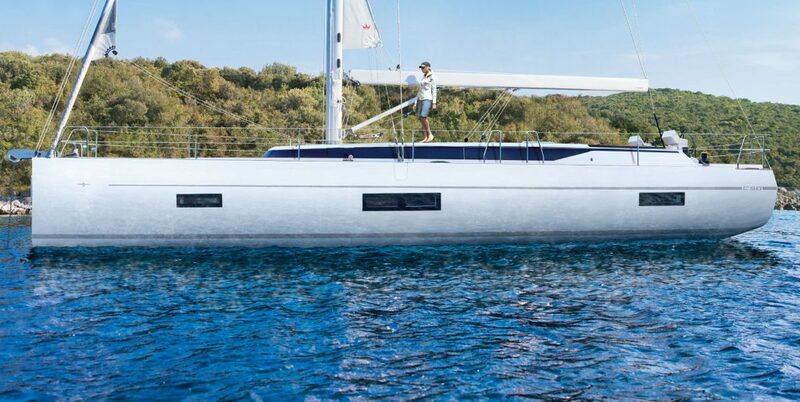 You have perfect visibility of all sails, crew and navigation equipment from either helm. 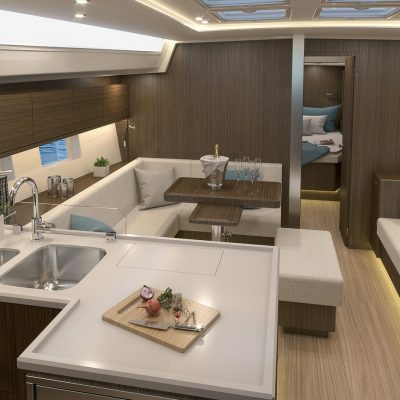 B&G Touch screen navigation, leading edge electronics packages, high grade Fusion entertainment systems and a furling mainsail option all adds to a better all round sailing experience. 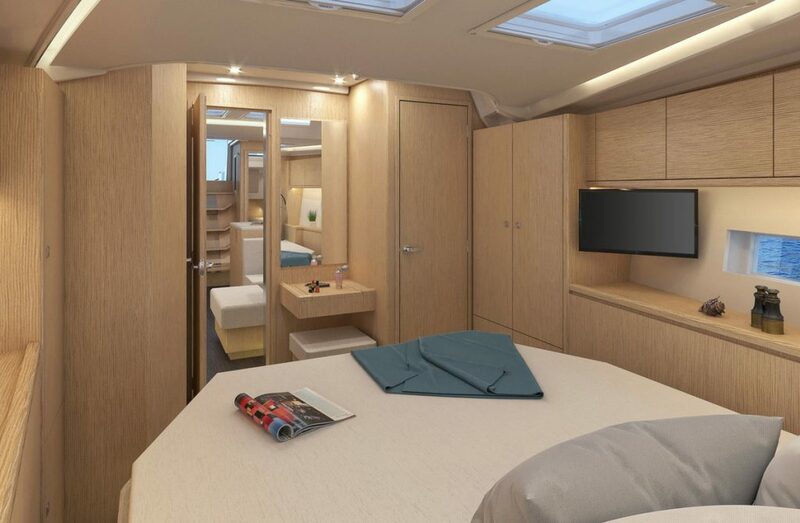 Even if you choose more cabins you still have ample space for relaxing. 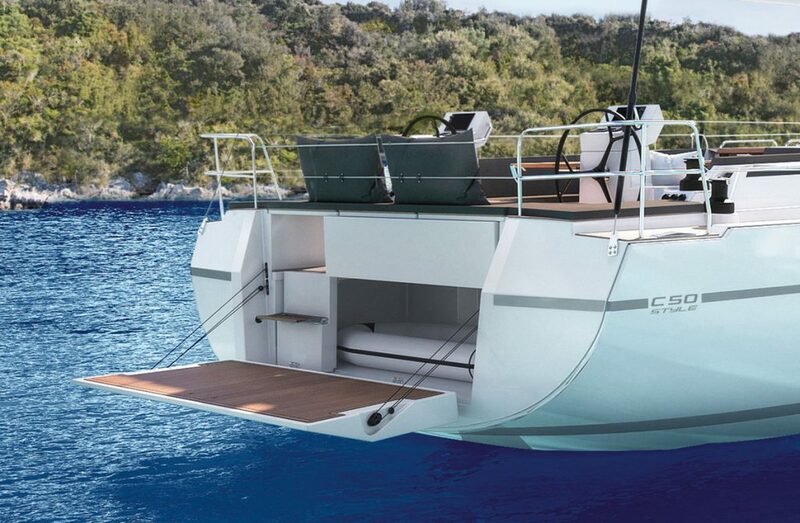 There is simply no compromise on this yacht. 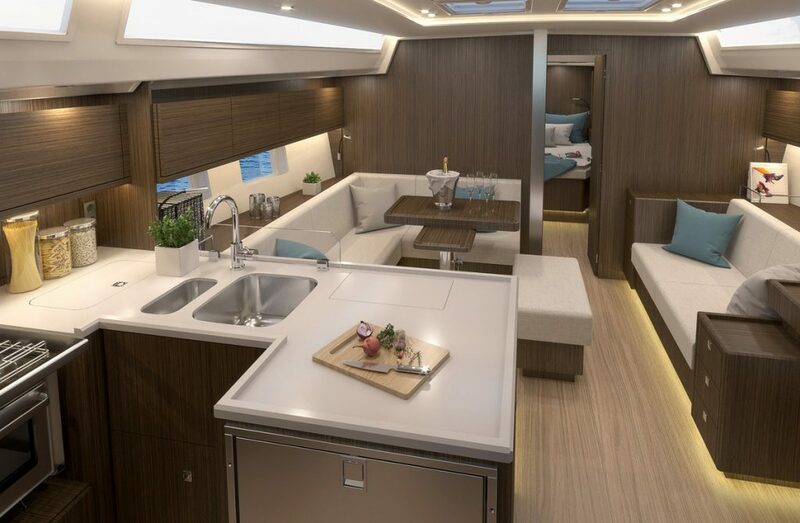 There is even more flexibility when choosing equipment, there are three versions offered to make sure there is something for everyone: the Holiday, Style and Ambition options. 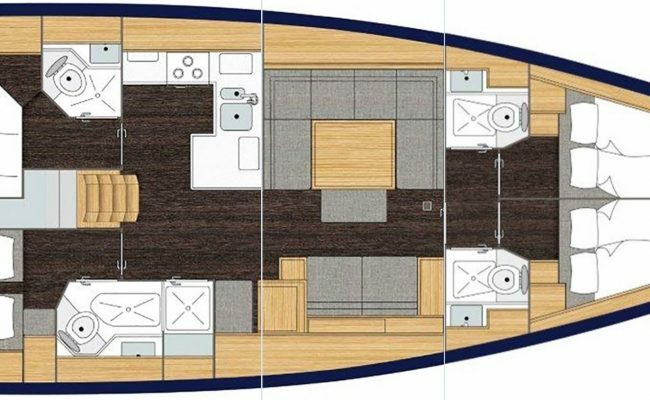 The comparison with a super-yacht is a good one. 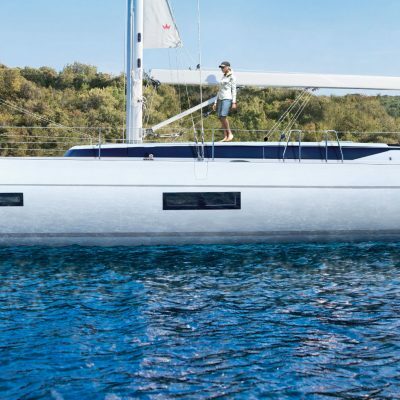 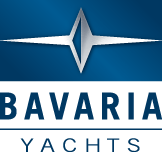 The Bavaria C50 doesn’t just look fantastic, it boasts features you would only expect in a bigger yacht. 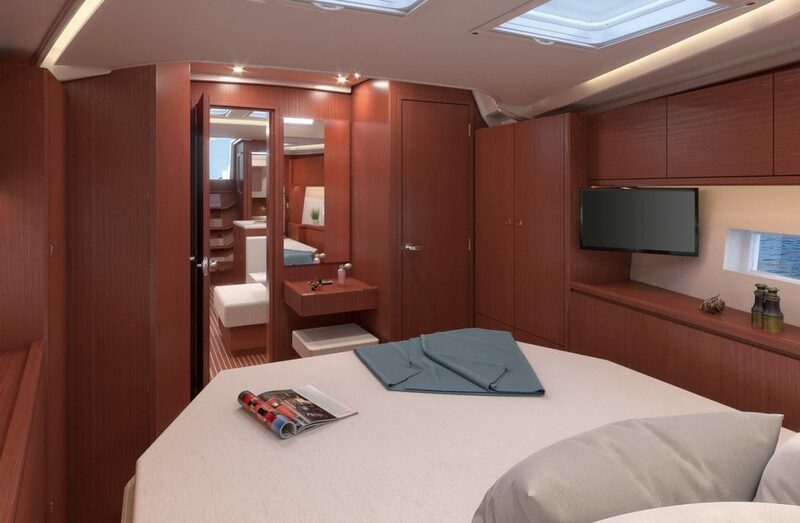 Your time aboard and the sailing itself will be unforgettable.